UNYA Leuven kindly invite you to their upcoming Diplomatic Dinner Talk! 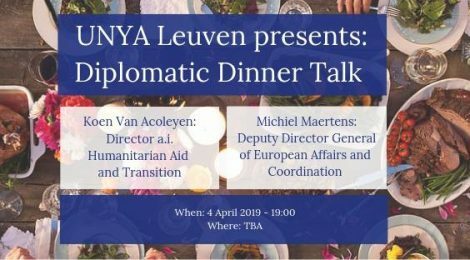 On Thursday 04 April, UNYA Leuven is offering their members and students a dinner talk with two diplomats at a cozy, local restaurant in Leuven. If you have any questions about career possibilities in diplomacy, about the practical experience in this field or about the life of an ambassador in general, then this is the perfect opportunity to get your answers! Their first guest is Michiel Maertens. With a diplomatic career of twenty years now, he gained expert knowledge on EU and UN matters. Nowadays he is the Deputy Director-General of European Affairs and Coordination of Belgium, which means he is concerned with the preparation of the Belgian position in the European Council and the General Affairs Council. Their second guest is Koen Van Acoleyen, the Director a.i. Humanitarian Aid and Transition. His mandate concerns, amongst others, innovation in humanitarian aid and the implementation of humanitarian aid in the root causes of in long lasting conflicts, He worked several years as an ambassador in the Belgian embassy in Kinshasa and Peru.